Tiny Hands Adventure is an amazing action adventure game developed by Blue Sunset Games, Funware. Borti is a young and cheerful T-rex, he has many friends and love to play soccer with his school team. But there is one thing that Borti would want – longer arms. Join Borti on his quest to find the best replacement for his tiny hands and arms. Explore several unknown worlds, find all the collectables and face bosses that have what you want. 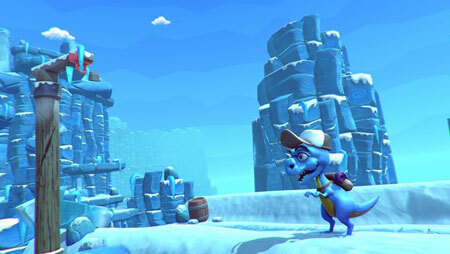 The game features beautiful 3D graphics. Collect different tools and weapons for Borti and use them in game. From sticks, through compact drills to mechanical arms and more. Visit over 20 stages, set across multiple location themes and fight with bosses. If you get stuck in the game, check out the video walkthrough and gameplay for the game. This entry was posted in PC Games, Walkthrough and tagged Tiny Hands Adventure Cheats, Tiny Hands Adventure Game, Tiny Hands Adventure Gameplay, Tiny Hands Adventure Guide, Tiny Hands Adventure Hints, Tiny Hands Adventure Review, Tiny Hands Adventure Solutions, Tiny Hands Adventure Strategy, Tiny Hands Adventure Tips, Tiny Hands Adventure Walkthrough by Marvin. Bookmark the permalink.